Ever since I was young I found myself fascinated with puzzles. Mainly the type of puzzles where you put things in some sort of order. I didn’t really realize how much I enjoy a simple relaxing puzzle until I finished making Sudoku In Space and started playing it. It has also made me realize my love of puzzles and why I’m gravitating toward making puzzle games. Puzzles can be frustrating, but at the same time they can be relaxing. Once you get the hang of how to do a puzzle it can provide a meditative experience. Sudoku is a great puzzle for this type of response. It doesn’t take a lot to learn how to solve a Sudoku puzzle, but it does require a lot of your focus and attention. I tend to focus so well on the puzzle that I often don’t think of much else. In this respect it has been great once again playing Sudoku. It creates a nice, simple, and healthy escape. Once I near the completion of a Sudoku puzzle any frustration from the process melts away and I get a nice reward from it. It’s impossible to control the world and put much order to it. Most people really enjoy order and avoid chaos as it can be a source of stress. Even if you’re not aware of it, nearly all of us are looking to put order to our worlds and avoid chaos and disorder. I feel that Sudoku is a great opportunity to experience this. You can’t control the world but you can solve a Sudoku puzzle. Sudoku provides a therapeutic relief of stress by allowing you to put something into order. Sudoku In Space attempts to take this further by putting you in an outer space atmosphere with really great relaxing music by Adi Goldstein, twinkling special effects, and unintrusive sound effects. 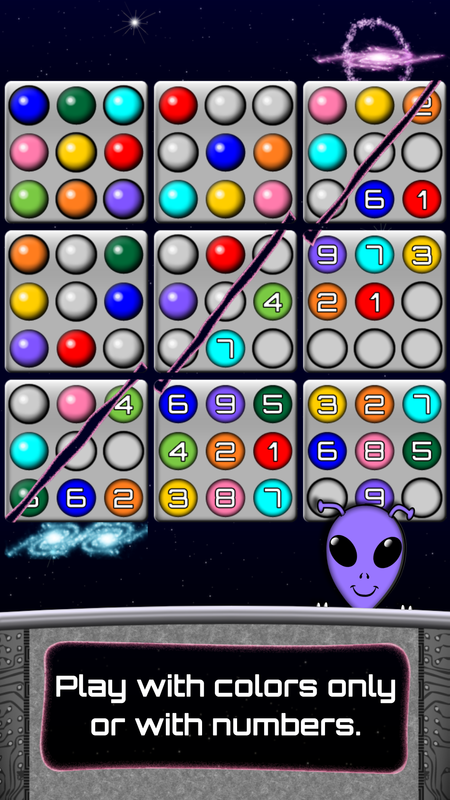 Allen the Alien welcomes you to his world of puzzles in space and I find it hard to stay away too long. Soon we plan to add a story for you to adventure with Allen through the universe so that the game provides a more unique and immersive experience than any Sudoku game has ever attempted. Sudoku can improve your memory – Since memory and logic work together so closely Sudoku enables you to use exercise them in a fun way. The memory component of Sudoku is not very taxing. You’re able to visually examine the game board for the missing numbers (or colors! ), but whether you know it or not, you’re still exercising your memory. Especially when you’re eliminating colors or numbers as possibilities for a cell. As you become more familiar with Sudoku I’m sure you’ll find yourself relying on your memory more and more instead of penciling in guesses all too often. As with most puzzles Sudoku stimulates your mind. The way Sudoku does this is it gets you to constantly think logically about where the next number or color should be placed. Also, you might not be aware, but when solving a Sudoku puzzle you’re building an algorithm in your mind of how to solve the puzzle. The more you play the better this algorithm will become and the stronger your logic can become in every day tasks. Sudoku also will help decrease your decision making time. After playing a few puzzles you will notice that the time to solve the puzzle is taking less and you’re able to make decisions quicker. At the same time your concentration level is increasing because the game requires most, if not all, of your attention. Your re-focus skills are also being sharpened because when you put down the game you can quickly jump back into it and keep going where you left off. The more you do this the more you’ll notice the benefit. 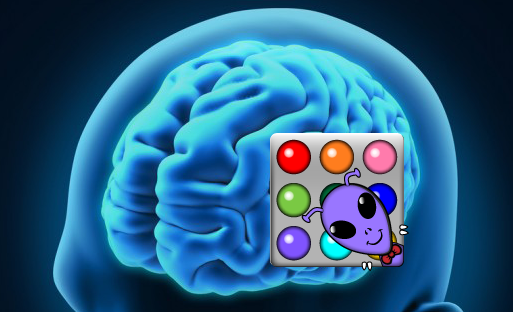 For a long time I have known that puzzles and other brain exercises help in reducing the chance of Alzheimer’s. However, I was not aware that games like Sudoku have been found very beneficial in strengthening your “cognitive reserve” which can help to lessen the effects of schizophrenia, bipolar disorder, and depression (see Sudoku to Beat Schizophrenia – D. Bradley). It has also been claimed that Sudoku may even increase your IQ (see Solving Sudoku Helps Improve IQ). I’m amazed that puzzles can have this great of an effect on the mind. One of the design goals of Sudoku In Space was to make Sudoku more appealing to children and people who don’t like numbers. We provide a small set of 4×4 puzzles so that someone who’s never played can get some experience without being overwhelmed. 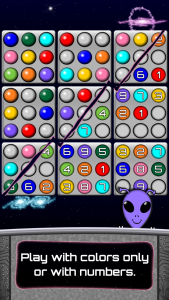 The space theme, bright colors and cheerful effects are there to give the game a bit more interest than the typical plain Sudoku game where it is just numbers in a grid. I really wanted to try to bring color Sudoku to the forefront with this game, because I know that, for many, just seeing numbers in a game can be a complete turn off. I’ve been pleasantly surprised at how many people are playing with just the colors. It has also been interesting to me personally to see how much faster I can solve a puzzle when the numbers are on because I have both numbers and colors to rely on. With so many games out there that simply provide distractions, I strongly believe that Sudoku In Space supplies players with more than just a distraction – it strengthens your mind! There’s nothing like improving yourself while having fun. It’s one of my favorite things to do and I hope to share that passion with the world as Napland Games creates more puzzle games in the future. I have many puzzle games planned for you all and I hope that they will be just as interesting (if not more) than Sudoku In Space. The next game I’m working on right now is a “Simon Says” / copy cat style game where you’re tasked with disarming time bombs. I’m not certain that the cognitive benefits will be as great as they are with Sudoku In Space, but I hope that we can provide a fun and challenging experience that also helps to strengthen your mind.